Pictures of revered teachers, places, rupas, temples, bhikkhus, shrine rooms etc. that bring inspiration to our members. Pilgrimage advice, devotion etc. Bodhi, a Pāḷi word meaning ‘awaken,’ is the name given to the particular tree growing at Bodh Gayā which the Buddha was sitting under when he became enlightened. This Bodhi Tree was a variety of fig known to botanists as Ficus religiosa and which has large spreading branches and rounded leaves with a characteristic pointed tip. In the several accounts of the Buddha’s enlightenment in the Tipiṭaka, the Bodhi Tree is only mentioned twice (D,II,4 and Ud.1, repeated at Vin.I,1-7). Tradition says that after his enlightenment, the Buddha stood for seven days gazing at the Bodhi Tree out of gratitude for the shelter it had given him (Ja.I,77), and modern Buddhists still revere this species of tree for the same reason. The present Bodhi Tree at Bodh Gayā was planted in 1880 and is distantly related to the original one. Bodhi trees are sometimes mistakenly called banyans although the banyan is a different species of tree altogether. This thread can be the place to post your favorite photos of the Bodhi Tree in Bodh Gaya or other Bodhi Trees from around the world or to discuss the Bodhi Tree and its significance. Good stuff Dr. S! Thanks! To avoid all evil, to cultivate good, and to cleanse one's mind — this is the teaching of the Buddhas. This is a close up of the leaves of a Bodhi Tree at Daham Nikethanaya in Yuroke, Victoria, Australia. Bodhi Trees take a fair bit of looking after to get them established at this sort of latitude, as they tend to prefer warmer climes. One of the resident bhikkhus advised me that Bodhi Tree saplings are often grown in glasshouses in order to get them established prior to planting them outside. Structures like this help to shield them from cold winds. This photo was taken by me at a famous shrine behind some of the main buildings on Shwedagon Paya. 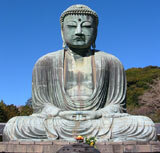 I believe it is the same Buddha image that Bhikkhu Pesala has as his avatar. Behind the Buddha image is a Bodhi Tree. Thanks KB, MikeNZ. Good information there about fig trees in general. Great photos, retro and Ben! The Jaya Sri Maha Bodhi Tree is located in Anuradhapura, Sri Lanka. It was grown from a sapling of the original Bodhi Tree the Buddha sat under and attained enlightenment. The tree is said to be the southern branch of the Maha Bodhi Tree at Bodh Gaya in India under which Buddha attained Enlightenment. It is the only sapling that was saved from the original tree. The original Bodhi Tree in Bodh Gaya was destroyed and the current Bodhi Tree there is a sapling from this tree in Sri Lanka, making the Jaya Sri Maha Bodhi in Sri Lanka the most authentic to the original tree the Buddha sat under and attained enlightenment. Many Sri Lankans consider this to be the most significant Buddhist site in the world due to the above. I have noticed that nearly all Sri Lankan temples have a Bodhi Tree on their grounds. Some have elaborate designs surrounding the tree, with an open pavilion and tiles around it. Temples from other cultures, countries don't seem to have it at the same rate as the Sri Lankans. Sri Lanka's significance to Buddhist history / the Bodhi Tree certainly must play a role in the significance of it to the Sri Lankans. David N. Snyder wrote: Bodhi, a Pāḷi word meaning ‘awaken,’ is the name given to the particular tree growing at Bodh Gayā which the Buddha was sitting under when he became enlightened. This Bodhi Tree was a variety of fig known to botanists as Ficus religiosa and which has large spreading branches and rounded leaves with a characteristic pointed tip. In the several accounts of the Buddha’s enlightenment in the Tipiṭaka, the Bodhi Tree is only mentioned twice (D,II,4 and Ud.1, repeated at Vin.I,1-7). Tradition says that after his enlightenment, the Buddha stood for seven days gazing at the Bodhi Tree out of gratitude for the shelter it had given him (Ja.I,77), and modern Buddhists still revere this species of tree for the same reason. I almost had an opportunity to travel to Bodh Gayā this past November, although work got in the way so I could not go. Oh well! Several members of my sangha were able to go though. They visited Varanasi, Deer Park in Sarnath, Bodhgaya, Rajgir, Vulture Peak, Kushinagar and Lumbini. They said it was a very good trip and very motivating for their practice. This video, although not from people I know, has some good footage of the tree and Mahabodhi Temple right next to it. "Upon a heap of rubbish in the road-side ditch blooms a lotus, fragrant and pleasing. However, Although I mostly consider myself a follower of Theravada Buddhism, I do enjoy the practice of Mantra on mala beads. On my personal and self-made shrine at home, I keep and use a mala made from Bodhi seeds, with an extra carved wooden bead that has the character in chinese for "Buddha"
To me it is a good reminder that even if I never become a Buddha myself, it is possible to become enlightened, and I like to have it around my neck from time to time so that when I start to become angry, have wrong view ect ect...I can hold the beads in my hand and remember the practice. May ALL benifit from the teachings of the Buddha! I so love your picture of Bodhi Tree, exactly look like the Bho Trees in Thailand that I've seen at almost every Thai temples. When I was young there were no rest area on the highways in Thailand, whenever we needed rest after long drive, we would stop at a temple that we saw and stretched our legs by walking under the Bho trees that gave us super shade. In Thailand we call " Bho tree". After a major setback last year, I was finally able to visit India for pilgrimage in April with my husband. Seeing the Bodhi Tree, temple complex, and the Vajrasana in person was one of the most moving experiences of my life. We arrived before dawn at 4:30am and stayed until later in morning offering puja, taking refuge, offering dana, and sitting in meditation. We had a chance to do this over several days in the morning and evening. Rounding the corner for the first time to see the full Mahabodhi complex from the eastern gate was totally overwhelming and beautiful. I am so profoundly grateful to have been in the same vicinity as the Blessed One once was. BODHI: compiled by VENERABLE K. SEELANANDA from Inward Path Publishers. •	The world’s oldest tree planted by a human and with a recorded history is the Bodhi Tree which is still living in the city of Anuradhapura, Sri Lanka. According to records, it was planted in 288BC and was taken as a sapling from the Bodhi Tree under which Buddha became enlightened. •	A copy of the Diamond Sutra is the world’s oldest surviving printed book. Please take ten minutes of your valuable time to read the translation of this book which is a historical document describing how Buddha explains the concept of Anatta to his disciples. Be Great Merit accrue upon you !